Why is the ACT Science section so scary? When I took it the first time, it was fast paced, had a lot of difficult science terms, and seemed challenging. I think many students have a similar experience because the ACT Science section is unlike any other test you've taken, and is so different from the PSAT and SAT. 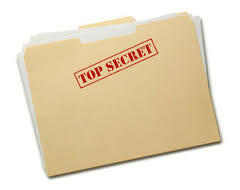 But there's a critical secret to ACT Science - you actually don't need to know much about science to do well. Instead, you need to be able to practice critical reasoning well - this is the fundamental basis for ACT Science! In this article, I'll try to make the ACT Science section less mysterious. Hopefully, by the end of this article, you'll understand that any student can get a 36 on the ACT Science section - no matter what grades you got in your science classes. Do You Need High-Level Science Knowledge to Succeed on ACT Science? While you would think the section would test high-level science knowledge, there is very little actual science knowledge necessary, only around 4 questions out of 40 rely on outside science knowledge. Instead, you need to have reading skills to succeed on the ACT Science section. Huh? But I can't read. Counterintuitive, I know, but the ACT Science section purposely focuses on basic skills. Think about the logic. The ACT is a nationwide test, administered to over a million students every year. Every student takes different levels of science. Some take AP/IB level tests. Others don't even fulfill the high school requirements for basic science courses. Thus, it wouldn’t be fair for the ACT to test AP or IB level Physics, Biology, Chemistry, or Environmental Science knowledge because few people in high school can take all of that science at the advanced level. Thus, ACT Science needs to be a level playing field, nationwide. So what does it actually test? What Reading Skills Does the ACT Science Section Test? I'll discuss the major critical reading skills needed for ACT Science. Once you understand these, you'll see why you'll be able to excel on ACT Science, no matter what your grades were in your science classes. 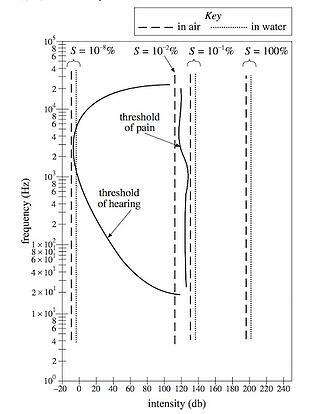 Yes, this is a real ACT Science section graph. Although the graph gives many different pieces of information, ignore all of the extra information and just focus on what the question is asking. Does S depend on frequency? Labels are very important. I can find the graphs of S by looking at the top of the graph and seeing where S is labeled. At all of the different values of S, S is graphed as a vertical line. As frequency increases (which happens along the y-axis), the S is unchanged (remains constant). Therefore, the answer is J. Learn about the 3 types of ACT Science Passages for more information about this strategy. For the questions you can’t answer using the visuals, you'll be able to answer them by reading the passage. The only questions you will not be able to answer with visuals or the passage are the 4 previous knowledge questions that I mentioned earlier. The ACT Science section tries to make the passage more difficult by throwing in large scientific terms. Don't be afraid of them. The ACT typically either explains what the words mean, or it is not necessary to know what the words mean to answer the question. 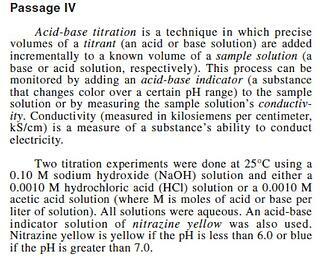 The passage below has big terms like acid-base titration and nitrazine, yet we will easily solve a question from the passage. With only 35 minutes to answer 40 questions (52.5 seconds per question), you cannot afford to waste time reading the entire passage. I recommend going directly to the questions. Try to answer the questions first by reading visuals. Then, if you're really stuck, try to skim the passage to answer the question. If you don't like this strategy, you can start by skimming the passage and then answering questions, but you do not have the luxury of leisurely reading the entire passage. To the answer this question, you need to start by looking at Figure 2 for Experiment 2. 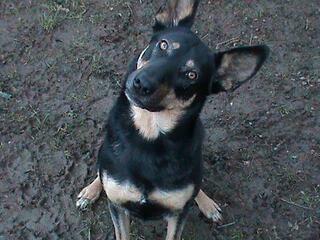 Be sure to look at the right data, make sure you are looking at Experiment 2 Figure 2, not Experiment 1 Figure 1. Otherwise, you could end up with the wrong answer. 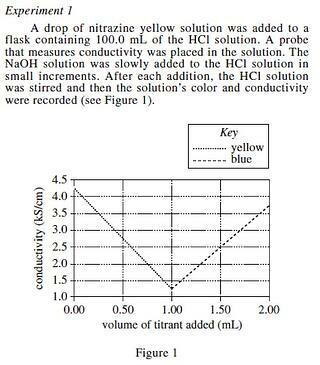 At 0.2 mL of titrant added, the color was yellow. 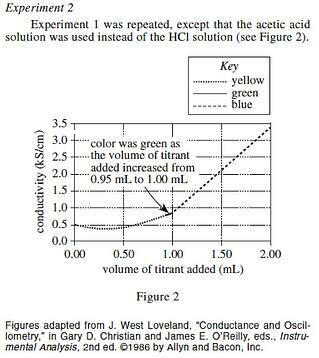 At 1.8 mL of titrant added, the color was blue, so you can eliminate B and D.
However, you don’t know what the difference between yellow and blue means in terms of pH, so you need to skim. You only need this sentence from the very end of the introduction to find the final answer. 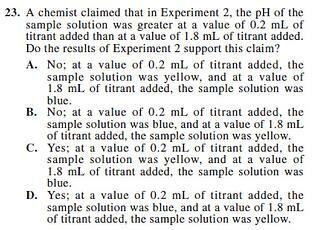 So, according to the passage, blue means greater pH than yellow, so the answer is A. You can now see how skimming can quickly lead you to the correct answer, but is skimming always the best approach to answering ACT Science questions? The only exception to the skimming rule is on the Conflicting Viewpoints Passage. (See our article on the 3 types of ACT Science Passages for an in-depth summary of Conflicting Viewpoints Passages). 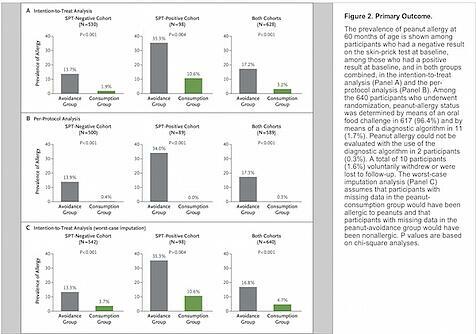 There is only 1 Conflicting Viewpoint Passage per test (out of a total of 7 Science passages). This passage has no visuals, only words. You need to read the entire passage. You need to figure out how the two scientists, students, or theories differ in opinion. After reading this passage, you should be able to discern that Scientist 1 thinks the object was a comet while Scientist 2 thinks the object was an asteroid. To answer question 12, you must have read the entire passage, including the introduction. 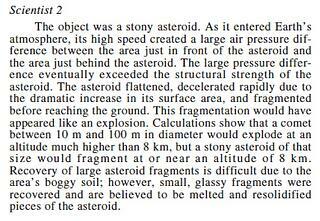 If you read the introduction, you know it says the object was between 10 and 100 m in diameter. 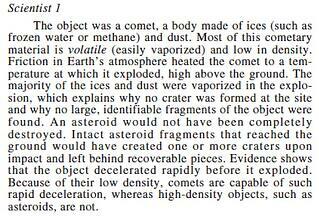 If comets are much larger than 100 m in diameter, then the object could not have been a comet. That would definitely weaken Scientist 1’s argument that the object was a comet. So, the answer is G.
But the main point, again, is this - you don't need to know anything about the science underlying this passage. You need to read effectively and employ critical reasoning. Side note: the introductions in ACT Science passages often hold nuggets of gold because the ACT Science test makers realize most students are likely to skip it. Conflicting Viewpoints Passages test your reading comprehension ability, very similar to the passages in the Reading section. Be sure to pay close attention when reading Conflicting Viewpoints passages. So, if you were freaking out about ACT Science, take a breather. You can get a C in Biology and still do well on ACT Science. But that doesn't mean you don't have to work hard and practice. How Do You Improve These Reading Skills To Do Well on ACT Science? Since the ACT Science Passages are similar, it'll give you a leg up since you'll already be familiar with reading this type of passage. 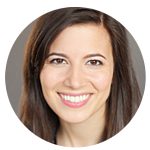 You'll be more familiar with the scientific method and looking at scientific data. I recommend Science Daily. It is a free science news source, and the articles are very easy to understand. 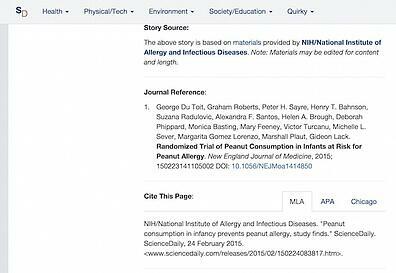 Check out this article about a study on peanut allergies. I recommend reading their articles as well as the original journal article (which they link to at the bottom of their articles). What is the main point of the experiment? How were the experiments supposed to validate the hypothesis? When looking at the visuals in the related journal articles, what is being depicted? This is how scientific research works, and this is what ACT Science expects you to be able to decipher. While your classes will likely be more challenging than the actual ACT science section, they'll also help you become more familiar with the scientific method and looking at scientific data. Review ACT Science while you take science classes. The more basic science terms you know, the easier the ACT Science section will be and the faster you will be able to answer questions. As I said before, the Science section is more about reading graphs and tables, so you need to drill this skill. Also, the Science is one of the most time sensitive sections of the test. With only 5 minutes per passage and less than 1 minute per question, no matter how well you understand the material, you need practice. Find good study material. Check out these recommended books. Check out PrepScholar’s program. PrepScholar breaks down each section into the skills you need to master, then gives you focused practice on each skill. This way you work on your weaknesses, whether that's interpreting data or understanding the basis for experiments. I hope understanding this brings you a big sigh of relief. You DON'T have to be a science expert to do well on ACT Science. But you DO need to know exactly how ACT Science tests you, and you need to know how to practice to excel at it. Learn the 3 types of ACT Science passages, the only actual science you need to know for the ACT Science section, what's tested on ACT Science, and the best way to read ACT Science passages. Like this article? Want to improve your ACT score by 4 points? Our program is entirely online, and it customizes what you study to your strengths and weaknesses. If you liked this Science lesson, you'll love our program. Along with more detailed lessons, you'll get thousands of practice problems organized by individual skills so you learn most effectively. We'll also give you a step-by-step program to follow so you'll never be confused about what to study next.